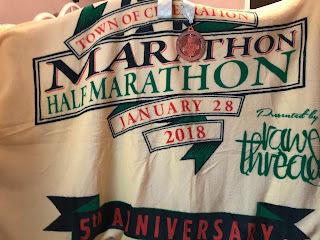 On Sunday, I had the honor of running both the Celebration Half Marathon and my fastest half marathon since I moved to Florida! I woke up at the lovely hour of 5:00am and arrived at Celebration around 5:45. Thankfully, I was able to find parking and relax (more like nap) for a bit before heading over to the starting line. The start was clearly marked with the various pace groups and I decided to line up between the 2:30 and 2:45 group. My goal for this race was to run consistently between an 11:00-minute and 12: 00-minute mile. I really wanted to try for a sub 2:30 but because I had been sick the entire week leading up to the race, I figured I would be better off trying to stay with a consistent pace. The race started and I settled into my pace. I went a bit fast at the start to find a nice spot in the pack but settled into my run/walk intervals after about 5 minutes. The first mile was completed at an easy 11:51, the slow speed felt wrong but I knew that I was making the right choice to hold myself back. Mile 2 took 11:17, and as I neared the end of it I realized that I really had to use the restroom. Thankfully I knew that there would be one around the 2.5-mile mark so I hustled through that half mile in 6:40 to get there with time to waste. Unfortunately while pausing my Garmin I bumped it and ended the activity, so my data for this race is separated into two different Garmin entries. I swear, I'll eventually learn how to use this watch! From mile 2.5 to approximately 6.5 I was able to maintain a consistent pace between 10:57 and 11:45. It was at that 6.5-mile mark that they were handing out gels, so I took my time walking to finish it. I accidentally grabbed the Double Expresso gel and was surprised to find that it worked extremely well for me! The taste wasn't bad and my stomach really seemed to agree with it! From there my pace ranged from 11:00 to 13:17. The 13:17 occurred on a huge stretch of the boardwalk where I got boxed in behind some other runners. Normally, this would have upset me but the scenery was so pretty that I decided to focus on enjoying the race. Once the boardwalk ended I was able to pass the other runners and settle back into a steady 11:45 pace. This section went through the neighborhood and then back onto the boardwalks. My least favorite part of this race was honestly the last boardwalk section. I knew that the finish line was coming up quickly and was actually disappointed by this. I crossed the finish in 2:40:48, which should be disappointing because I have run faster half marathons, but this was the fasted half I have completed since moving to Florida! This race helped prove to me that I can race properly and I do have the ability to successfully run a half marathon. My pace was the most consistent it has ever been, and I felt great after the race. Usually, I am exhausted and feel as if my legs are going to give out but this race left me feeling fine! 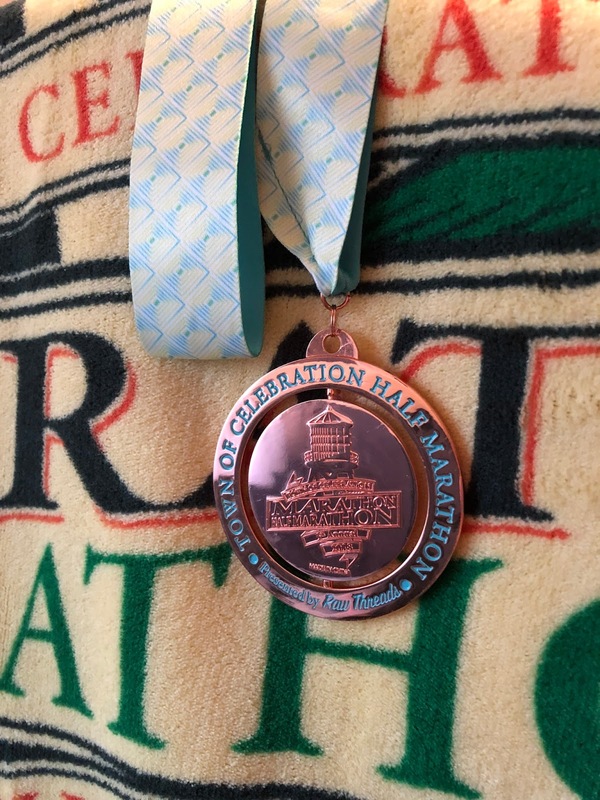 I want to be a sub 2-hour half marathoner, but this race proved to me that I need to focus more on maintaining a consistent pace as opposed to racing against the clock. After seeing that I can complete a half, in Florida, in 2:40 I have decided to set my goal for Princess at 2:35. That's enough time to shave off and feel successful, but not too much that I'll have to really push myself. 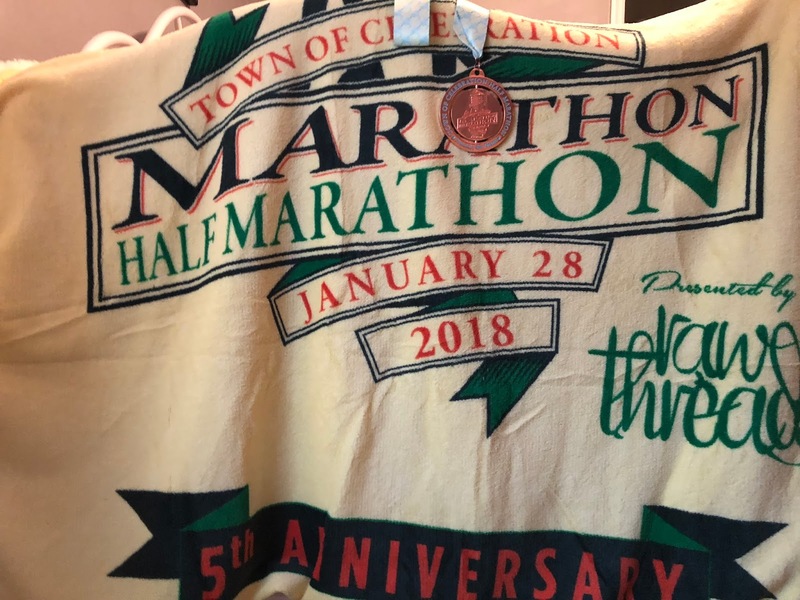 The awesome blanket that was part of the swag for this race! Overall, I would fully recommend the Celebration Half Marathon to anyone looking for a nice small race in the Central Florida area! I have already decided that I'll be signing up for the 2019 race as soon as it opens!